First news of a Hunts. casualty in the sinking of H.M.S. Barham last November announced by the Admiralty last week, when the news could no longer be of value to the enemy - has been received, by a strange coincidence, from the village in this county which bears the same name as the ill-fated ship. 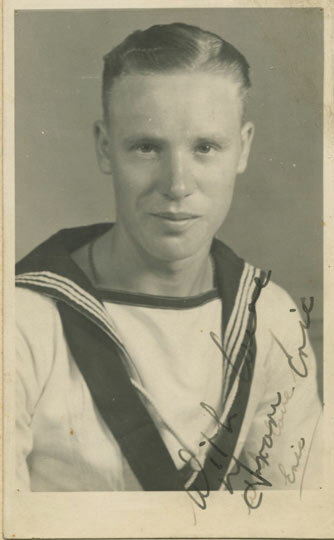 Mr, and Mrs. W. Goddard, of Barham, have been informed that their youngest son Ordinary Seaman Eric Goddard, aged, 19, lost his life when the ship went down. The fact that he had been lost at sea was reported in our issue of Dec. 18th. There was another coincidence in the short life of O/S Goddard. Born at York, he served, for three years on H.M.S. York and was rescued when that ship was sunk by the Nazis in Suda Bay. Before joining the Navy, O/S Goddard was employed by Mr. F. Cherrison, hairdresser, of High street, Huntingdon. The photo which we reproduce here, and also a number of Christmas cards, were received by his parents since he lost his life."